SINGAPORE - A decadeslong territorial row may be taking a new turn as Japan and Russia look set to uphold a 1956 joint declaration in which Moscow promised to hand over two disputed islands to Tokyo once a peace treaty was signed. 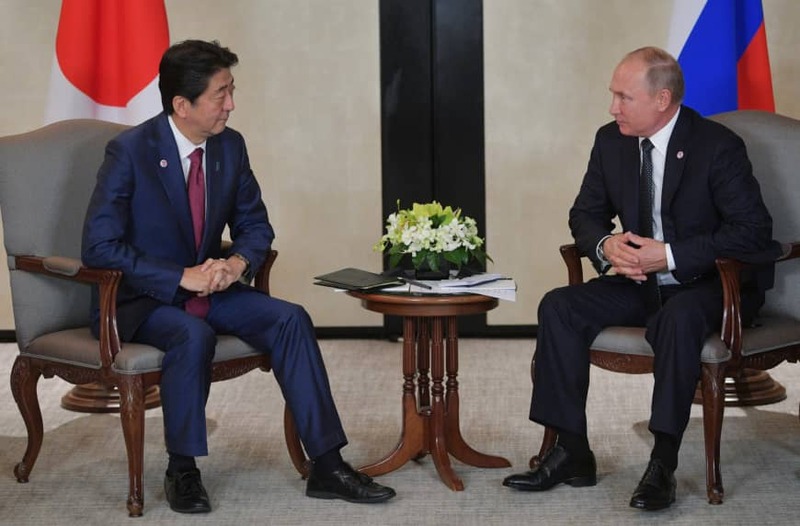 Prime Minister Shinzo Abe agreed with Russian President Vladimir Putin during a summit Wednesday in Singapore that they will accelerate peace treaty talks based on the document, in which Moscow vowed to return Shikotan and the Habomai islet group. The dispute over the islands off Hokkaido, seized by the Soviet Union following Japan’s surrender in World War II in 1945, has long been a thorn in bilateral relations, preventing them from concluding a postwar peace treaty. 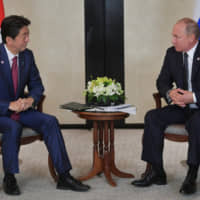 The latest agreement is seen as a change in Tokyo’s stance to demand Russia return all of the islands, and political analysts have called it a “realistic” approach to break the gridlock. However, the Japanese government maintains that Wednesday’s agreement does not signal a change in Tokyo’s policy of resolving the sovereignty issue for all the disputed islands before concluding a peace treaty. The outlook for quick and tangible progress is far from certain. Experts on Japan-Russia relations say it remains to be seen how serious Putin will be and that Tokyo will be required in forthcoming talks to maintain a delicate balance between Russia and the United States — Japan’s longtime security ally. Putin has acknowledged the legal validity of the 1956 declaration between Japan and the Soviet Union, which was meant to end wartime hostilities and restore diplomatic ties. “The importance of the agreement in Singapore is that it signals Abe’s willingness to compromise on this issue. It shows that he is a supporter of the idea of ‘two plus alpha,’ ” said James Brown, an associate professor at Temple University’s Japan campus. “To receive the smaller islands, Japan needs to accept that the two larger islands have been lost forever,” he said. Takashi Kawakami, a professor well-versed in security policy at Takushoku University, said the latest development reflects Putin’s strategy to “drive a wedge” in the Japan-U.S. alliance. Russia is concerned about a possible U.S. military presence on the islands if the handover materializes, so Tokyo and Moscow would have to take up that sensitive issue in future negotiations, Kawakami said. Abe said he will visit Russia in early 2019 to advance bilateral talks.